The exhibition is about the history of the Icelandic fisheries, from the time when rowing boats gave way to large fishing vessels. 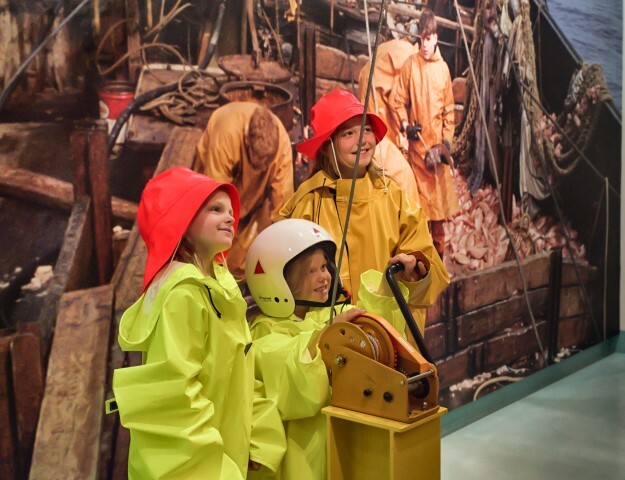 This rich history is told from the perspective of Iceland’s biggest fishing port, Reykjavík. Guided tours and introductions available in english. The value of fish to the Icelandic nation cannot be overstated. Over the centuries fish has been a staple of the Icelandic diet, and one of the nation’s most important exports. The Fish & Folk exhibition is built around the central character of this history: the fish itself. The fish is followed from the ocean, into the net, on board the boat, onto dry land and to its final destination – the plate. Rich visuals, both photographs and film, create a vibrant mood in the exhibition and deepen the visitor experience. It is possible to watch and listen to interviews with experts – mariners, marine biologists and fish factory workers – and old records from the fisheries in earlier times are also included. A range of interactive screens and games encourage participation, and various unusual features capture the attention and imagination, such as an enormous tower of dried saltfish and a tub full of less-desirable curiosities fished from the sea: plastic and other waste. Guided tours and introductions available in english. College and university teachers are invited to make use of the museum's versatile facilities. Please contact the museum education team for booking a visit. Admission is free for school groups of all ages when booked in advance.